Help, Inspire, or even Be Artists”. First of all I’d like to emphasize that all good programmers are artists, and as Richard Gabriel said 6 years ago, we programmers should be trained like artists. This is the major problem of our Computer Science Courses. For me, it was an honor to eat my morning croissant with Martin Fowler. Sharing my emotion with you! 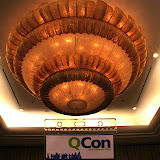 Here are some photos of the first and second days of QCON SF 2008. Enjoy!